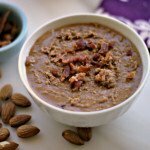 Delicious combination of flavors with maple, bacon and sweet almond butter that is both Paleo and low carb. Eat this salty, nutty bit of sweetness by the spoonful! Spread your almonds on a cookie sheet and bake for 10 minutes and then take them out to cool. When cooled, put your almonds into a food processor along with your salt, maple syrup, vanilla and avocado oil. Process for about 10 - 12 minutes until smooth. Scrape into bowl and add bacon bits. Mix to blend in the bacon.